Please note: This is not an achievement test. 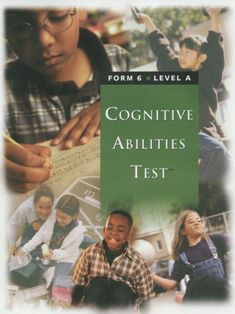 This test assesses students' reasoning and problem-solving abilities, giving you information in your report about how you can best adapt your instruction to your child's processing strengths, learning abilities, and preferences. Your score report will tell you your student's cognitive abilities profile. It will give you information about your student's learning style, abilities and preferences. This test can be used in conjunction with the ITBS® or ITED®, and your report will compare the results of the two tests. This combination of testing is helpful in identifying under or over achievers as well as your student's preferred learning style. Approximate testing time is 2.5 hours. All test materials must be returned undamaged, within 3 weeks after your testing date, unless permission is otherwise obtained. Damaged or lost materials will incur additional charges. Your report will yield standard scores, national percentile rankings, grade equivalency, and performance level. Your report will also identify specific areas of strength or weakness. You can expect your scores in approximately 3 weeks. Please select Grade Level below. Note: Please order Lvl A for advanced 2nd graders.